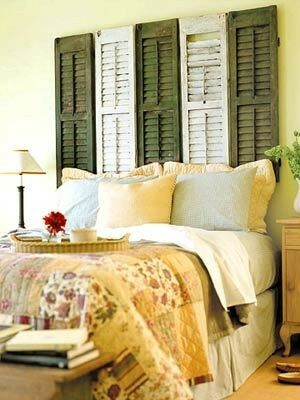 So this is the headboard I had my heart set on for a client project, an attic guest bedroom, I'm working on. Isn't she lovely? Well, it's affordable too. And so textured and interesting that it would make a great focal point for the bedroom wall. 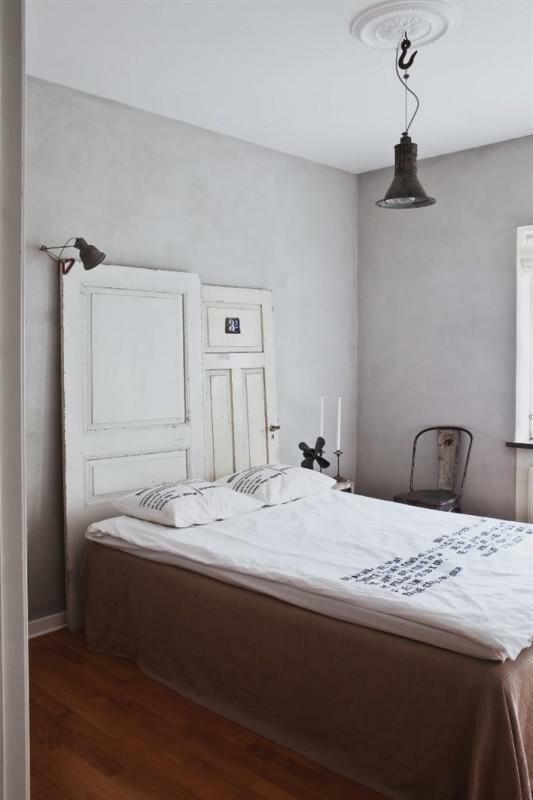 The problem is, the headboard is tall (why I chose it!). And wide (also great!). But it's absolutely too large to fit up and around the tight turns of the small attic stairs to the third-floor bedroom. So, what's our alternative? I love your inspiration ideas. We got rid of our headboard and footboard, but I wanted some sort of focal point above the bed. I went out and bought a couple yards of damask fabric and a large art canvas, then simply stretched the fabric over and stapled in the back. I hung it over the bed and added a wall candle sconce on either side. It's quick and easy, plus you can create a bunch of them for different looks throughout the year. That would look awesome in my room. We need to talk! 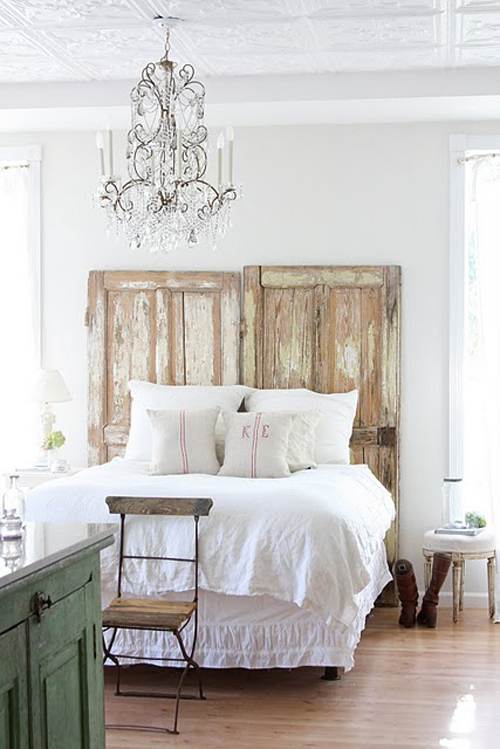 I like the last inspiration pic (Sherry Hart) - the barn type doors look more substantial than the shutters. You could also do a folding screen. Great ideas! Darn! I was torn at first on your alternative options, but after those last two inspiration photos I think I would go with doors. 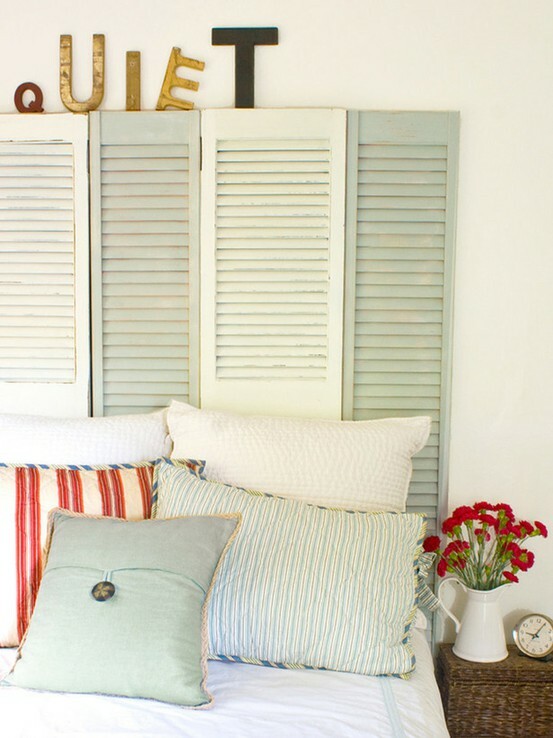 Any chance you could try a diy version of your initial headboard idea? It would be a lot to take on but might be do-able? If you like this look...get a piece of thin plywood and glue jute rope or if you like the thinner look use the jute string (comes in various sizes) You could mix the different sizes. Use a larger cording around the edges...Affix it to the wall and BINGO! Casey, I have not been here for a while because I am a busy summer Mom. But don't think that I have forgotten you! 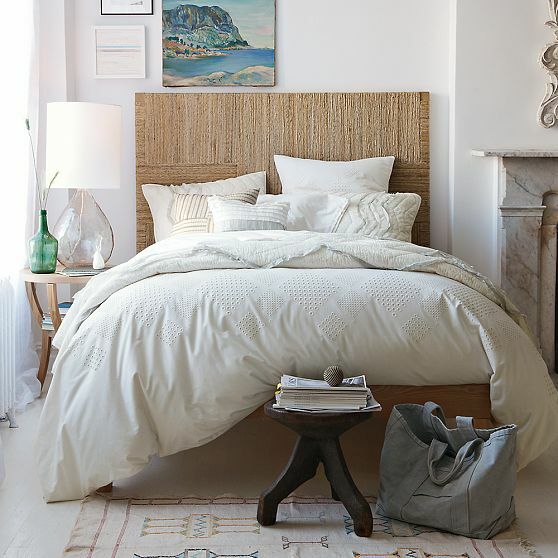 The west elm headboard is indeed fabulous. But I can't wait to see what you pick up at the local salvage yard. I know I am going to want the same! Can't wait to see what you come up with! Good luck! I have been DIYing myself recently. Using Rope like a piece of molding on my dining room ceiling then painting...looks like rope molding at a fraction of the cost! LOVE IT! Joanne, another brilliant idea. I love it! Send pics! Hi Karen, they are definitely one and the same. I use these for my own home and regularly for client projects too! They are the best I've found! So affordable and easy to install. Good luck! Casey ~ THANK YOU THANK YOU - such a sweetheart for getting back with me :-) I will be ordering some. Thank you for sharing your amazing blog.